I have to say this is pretty amazing. The WordPress blogging platform now offers artificial intelligence for proofreading, and we’re not talking any old spell checker. The proofreading feature checks spelling, misused words, grammar, and style. You can tell the type of error by its color. For anyone who self-publishes on the web this is “just what the doctor ordered.” There is only so many times you can proofread your own content. A little research shows that this feature is available using the JetPack plugin and comes from the technology After the Deadline which was purchased by WordPress. Science Experiment: How fast can you react? I love this piece from Scientific American, written in the format of a teaching lesson, instructing you how to perform a science experiment: How Fast Can You React? Think fast! Have you ever noticed that when someone unexpectedly tosses a softball at you, you need a little time before you can move to catch it (or duck)? That’s because when your eyes see an incoming signal such as a softball, your brain needs to first process what’s happening—and thenyou can take action. In this activity, you can measure just how long it takes for you to react, and compare reaction times with your friends and family. Keep reading – How Fast Can You React? Continue reading Science Experiment: How fast can you react? Posted on June 12, 2012 Author robotchampionCategories defaultTags chart, education, gravity, instruction, introduction, lesson, neuroscience, pencil, reaction, ruler, Science, scientific american, teaching, timeLeave a comment on Science Experiment: How fast can you react? 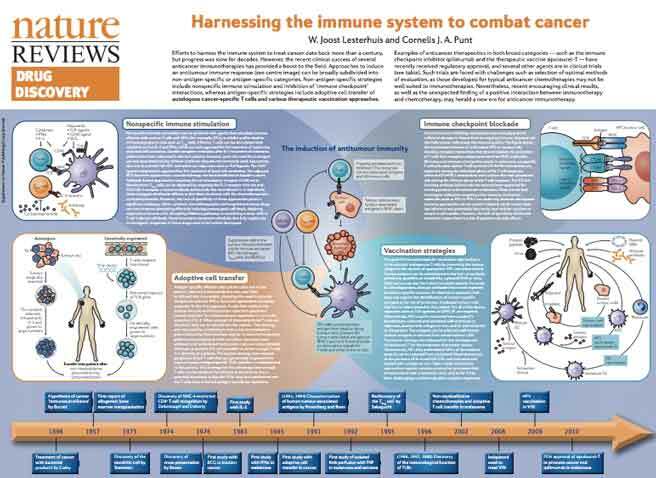 The concept of ‘teaching’ the immune system to recognize and destroy cancer cells is over a century old, but the development of immunotherapeutic strategies for cancer was slow for many decades. However, much has been learned about the immune system in the meantime, and with the recent approval of two new immunotherapeutic anticancer drugs and several drugs in late-stage development, a new era in anticancer immunotherapy is beginning. The video takes an audio-visual journey through the different approaches that are being investigated to harness the immune system to treat cancer.